It can be tough finding your first job and you need many tools to ensure you stand out professionally. 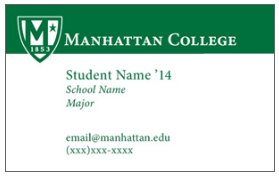 Consider ordering your own Manhattan College business card! Why do I need a business card? Whether you are meeting an employer at a career fair or talking with alumni at a networking event, it’s a great way to share contact information. It demonstrates you are professional and will set you apart from other students who don’t have cards. Aren't there more high tech ways of sharing contact info? Sure they are. But the challenge is that you don’t know if the person meeting you is very tech savvy or not. So keep it simple and use a professional business card. Why do I need to pay for Manhattan College business cards? Some websites might offer free business cards but they are often low quality, have an ad printed on the back and do not legally use the Manhattan College logo. The Center for Career Development has negotiated a special rate of $35 for 500 business cards. I don’t know what to include on my business card. Don’t worry! We have a pre-formatted template. Just fill out the form below. You will need to include your manhattan.edu email address and not a Gmail, Yahoo or other email address. Fill out the form below and then pay the $35 charge through Paypal after you receive the confirmation email. Then you’ll receive notification via email once the card is approved and the cards will be mailed to you in about a week.